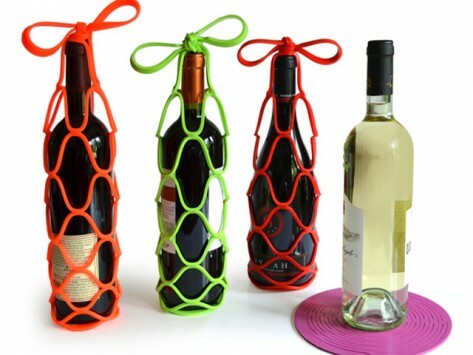 Colorful silicone netting to wrap and carry your favorite wine, keeping it secure and sophisticated. Dimensions: 7.25" x 7.25" x 0.25"
This works just like it shows in the picture, and it folds flat for storage. It is a great way to carry a bottle around for serving too, freeingtoo, freeing up hands for glasses. Beautiful and extremely spot on. Decorative and useful either as a carrier or soft landing pad. This is a clever invention. I thought it was a bit pricey, but it makes a nice gift presentation. The innovators at Infusion Living in West Chester, PA design sylish, functional products for the home, using versatile, colorful, food grade silicone. The Reform Flower Vase displays flowers in an elegantly curved, 7 “ high, leak proof container. But wait, you’re out of flowers and need a candle holder. Just fold down the sides (to 5” or as low as 3”), and it transforms. Configure it up to 6 different ways. It even converts into a wine cooler, utensil holder and a chip bowl. The uses are endless for this multi-tasking vase, perfect if you’re short on space, and even if you’re not. Infusion Living also makes brightly colored Bottlenets that are a perfect way to spark conversation and dress up a bottle of wine. The reusable netting is easy to carry and is stronger than a wine bag.